While we were farm sitting in Northhumberland County in June we had some free time to explore the surrounding area. 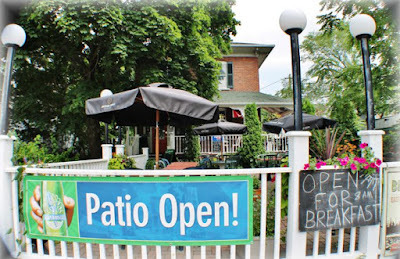 One of our favourite destinations is Campbellford situated on the Trent-Severn Waterway. It was a glorious summer day and a few of the local teens decided to go for a swim. We opted for a more sedate visit and strolled around the picturesque town. This mural of the Trent River's logging past is tucked in behind an LCBO (Liquor Control Board of Ontario) store and a parking lot. Continuing toward the river is this archway welcoming visitors. The wide walkways along either side of the river provide ample opportunities to enjoy all Campbellford and the Trent has to offer. One block east of the river is the main street. At one of the shops the owner suggested a few restaurants for a quick lunch. He mentioned a pub and we were off, but then we noticed Capers right next door. But chose the outdoor patio. We can't say enough good things about Capers. Excellent service, delicious food, great atmosphere. After lunch we strolled along the west side of the Trent and had to take advantage of a pic in front of the big toonie ($2. Canadian coin). A welcome centre and marina make this side a must for boaters. John took one look at these kayakers and considered hijacking one. Fortunately he showed some restraint...some! Next we walked across the Ranny Gorge suspension bridge. The views of the river are impressive. Last, but not least, we toured the lift lock. Given its natural beauty it's no surprise Campbellford is a four season destination. We'll definitely be back!